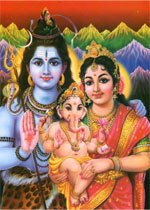 Welcome, to the Shiv Uma Ganesh Mandir. We thank you for visiting and hope you find the information you need and take some time to view our events upcomming events and picture gallery. Our site is being updated weekly, so please return to keep up to date on the happenings in the mandir. Services are held regularly every Sunday from 10AM - 12PM at the Shiv Uma Ganesh Mandir. View a list of past and upcoming events.